There’s an excellent chance of frost in this corner of the universe: astronomers have spotted a “snow line” in a baby solar system about 175 light-years away from Earth. The find is cool (literally and figuratively) in itself. More importantly, however, it could give us clues about how our own planet formed billions of years ago. “[This] is extremely exciting because of what it tells us about the very early period in the history of our own solar system,” stated Chunhua Qi, a researcher with the Harvard-Smithsonian Center for Astrophysics who led the research. “We can now see previously hidden details about the frozen outer reaches of another solar system, one that has much in common with our own when it was less than 10 million years old,” he added. The real deal enhanced-color picture of TW Hydrae is below, courtesy of a newly completed telescope: the Atacama Large Millimeter/submillimeter Array in Chile. It is designed to look at grains and other debris around forming solar systems. This snow line is huge, stretching far beyond the equivalent orbit of Neptune in our own solar system. See the circle? That’s Neptune’s orbit. The green stuff is the snow line. Look just how far the green goes past the orbit. 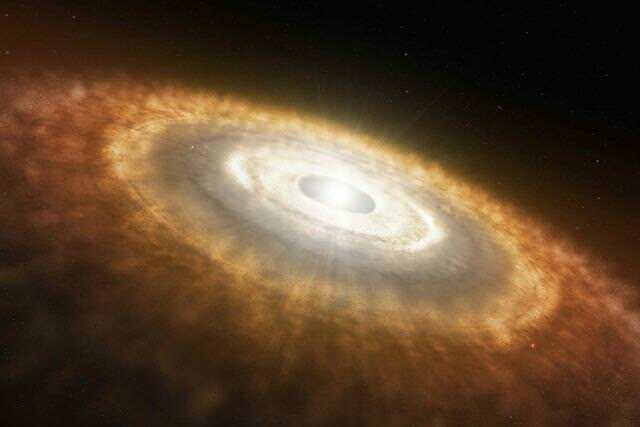 Young stars are typically surrounded by a cloud of gas and debris that, astronomers believe, can in many cases form into planets given enough time. Snow lines form in young solar systems in areas where the heat of the star isn’t enough to melt the substance. Water is the first substance to freeze around dust grains, followed by carbon dioxide, methane and carbon monoxide. It’s hard to spot them: “Snow lines form exclusively in the relatively narrow central plane of a protoplanetary disk. Above and below this region, stellar radiation keeps the gases warm, preventing them from forming ice,” the astronomers stated. In areas where dust and gas are more dense, the substances are insulated and can freeze — but it’s difficult to see the snow through the gas. In this case, astronomers were able to spot the carbon monoxide snow because they looked for diazenylium, a molecule that is broken up in areas of carbon monoxide gas. Spotting it is a “proxy” for spots where the CO froze out, the astronomers said. The snow was actually spotted with only a small portion of ALMA’s 66 antennas while it was still under construction. Now that ALMA is complete, scientists are already eager to see what the telescope will turn up the next time it gazes at the system.